The High Grip Tensioner System has been developed as a solution to the problem of belts bouncing and skipping teeth at high RPM, which can have catastrophic results. For many years, race and rally teams have preferred to use the original 2 piece tensioner system as it is more reliable than the later single piece tensioner. However, this has the disadvantage of not using a small idler bearing to reduce belt bounce and flex. RCM's solution to this problem is a completely bespoke billet aluminum bracket, which utilises the original tensioner, and incorporates the later 2002+ small idler bearing. An extremely worthwhile modification on all high revving engines, this kit is an absolute must on cars fitted with a sequential gearbox. 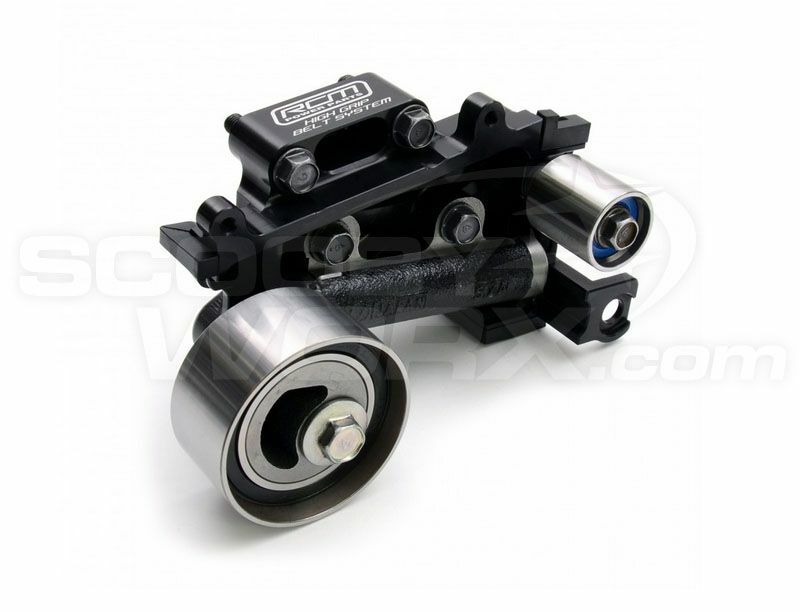 This kit is for use where the later style system is in place and will replace the whole bracket, hydraulic tensioner and tensioner bearing, along with the small idler bearing.